It's one of Lerwick's best known landmarks, but there is more to the Queens Hotel than meets the eye. Standing proudly in the sea at Lerwick's historic South End, the Queens Hotel dominates the waterfront and has done so since 1868, but the buildings which comprise the hotel were previously a combination of - at various times - houses, offices, shops and lodberries. Hay's lodberry was nearest to the Old Tollbooth, then Murray's with Yates's to the south. It was at Murray's Hol, an open space between Hay's lodberry and Murray's lodberry, where under the cover of darkness contraband could be smuggled ashore. It is believed that there was a tunnel from there to houses in Scottshall Court on the opposite side of 24 Commercial Street, where John Murray lived in the late 1700's. The story begins in 1804 when James Hay along with his sons took the first step to establishing a retail trade. They acquired a site south of the Old Tollbooth and built a house and lodberry with a stone jetty where goods could be transported ashore from vessels anchored in the harbour. One of James's sons, William, went into partnership with his father in-law Charles Ogilvy in 1822, creating the firm Hay & Ogilvys and establishing the Shetland Bank. Unfortunately, the firm and bank were declared bankrupt in 1842. Afterwards William joined his sons George and Arthur in business under Hay & Company. Records would suggest that the headquarters and shop were in premises William Hay had bought in 1813 from the sequestrated estate of Nicol Sinclair, which included a house, offices, shops, cellars and a lodberry which was situated at the north end of the property. Following his father William's death in 1856, George H B Hay inherited the Hayfield Estate and later moved his family into the Hayfield House. In 1868 he converted his former residence, the houses on each side, offices and a shop to create the Queens Hotel. He then leased it out. The first proprieter was a Caithness man, Thomas Evans who, along with his wife, was reported as being experienced in the business. 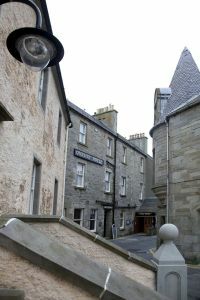 The 20-30 bedded "first-class hotel, the finest premises in Lerwick" also had a stock of horses and conveyances for hire. His business was short lived as by 1870 it was in sequestration and he moved to Orkney. In 1872 the next leaseholder was James Connan, who was also proprieter of the Kirkwall Hotel. He advertised the premises as"the only licensed hotel in Shetland, complete with 30 bedrooms, a number of Private Parlours, a large Coffee Room and a magnificent Commercial Room". Excellent trout fishing in a number of lochs throughout Shetland was also promoted. The hotel prospered and was a popular venue for both businessmen and tourists. An advert in 1881, by the proprieter Alexander Henderson, stated that a boat from the Queens met the steamers on arrival and from their anchorage conveyed passengers, and their luggage, direct to the hotel. However, in 1887 the Queens was the venue for a banquet following the opening of the Victoria Pier. 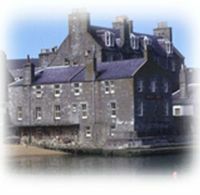 Geoge Sinclair, proprieter submitted an account for £44 for wine, but Lerwick Harbour Trustees argued that, as some of the wine had been returned unopened, they were only willing to pay £31. George H B Hay died in 1890 and his brother Arthur inherited the Hayfield Estate. As the head of Hay & Co, he was the largest employer of labour in Shetland. Following his death in 1896, the Hayfield Estate passed to his only child, Margaret Elizabeth Hay. The Queens Hotel continued to thrive and as a consequence, in 1910 an additional 10 rooms were built on the south side of the establishment, extending what had earlier been the Henry family home. 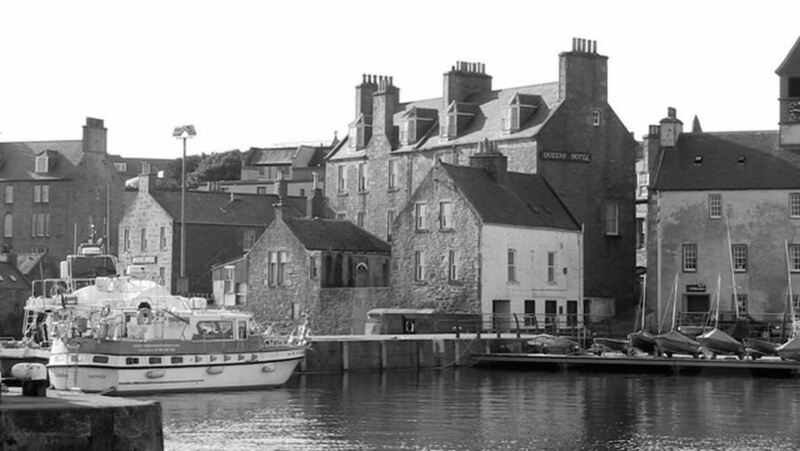 In 1914, Lerwick Harbour Trust constructed the breakwater and created the small boat harbour. This move was detrimental to the hotel as the backwash from the the pier began to cause damage to the lodberry foundation. A legal dispute lasting from 1915 to 1917 between Miss Hay and Lerwick Harbour Trust was resolved by the building of a protective sea wall. What could potentially have been a serious incident occured in 1926. Electricity was not available in Lerwick until the early 1930's and, until then, the town was lit by gas. Early one morning towards the end of November a maid lit a gas burner in the chandelier suspended from the roof in the Commercial Room within the hotel. Soon after, there was an explosion followed by the sound of breaking glass. The room was extensively damaged with a large hole in the brick partition and three windows facing Commercial Street were blown out. Remakably, a large mirror and items of furniture were undamaged and there were no repots of injuries. In addition, the large plate glass window was damaged in Mr Harris's ladies outfiter shop on the opposite side of the street (now the Lodberrie Deli). After the death of Miss Hay in 1937, ownership of The Queens Hotel buildings remained in the family when her cousin, Colonel Westwood Norman Hay, inherited the estate in 1939. The hotel continued to be run by a series of managers. One was Donald Swanson originally from Thurso who, at the outbreak of World War 1, was employed in the hotel. He immediately joined the Royal Navy and was subsequently posted for duty in Shetland waters. In 1929 he took over the Queens from the proprieter, George Sherman, who moved to Biggar. Over the years Donald built up the business and introduced many modern improvements, such as hot and cold water in every bedroom, and in 1939 he purchased the hotel from the Hay family. His son, Stanley, was born in the Queens Hotel and he also became a well known and succesful local businessman. The function room was used as an Up-Helly-A' hall from before World War 1 until 1975, but was not popular with guizers due to the restricted space in the narrow corridors. In 1948 the hotel was sold to Yell man Lauurence T Thomason, merchant, who incidentally was Guizer Jarl in 1954. Two years later, in 1956, local businessman Alexander I Tulloch bought the hotel and traded as Queens Hotel of Shetland Limited. He also owned the Shetland hosiery business Tulloch of Shetland. A popular holiday job for schoolboys in the early 1960's was as a hotel "boots", namely cleaning and polishing footwear left by guests outside their bedrooms, helping with odd jobs around the hotel and transporting luggage. It was a most enjoyable experience that was greatly enhanced by the kindness and good humour shown by my direct "boss", handyman Attie Williamson and his wife Mimie Who was cook. Lessel Allan was the hotel manager. The Lounge Bar was a very popular comfortable place for locals to meet up for a chat by the fire. On the wall opposite the windows was the mural depicting the "Sooth End" which had been painted by Jim Kerr in the early 1960's at the request of Mr Allan. It was greatly admired by all. A welcoming face behind the the Lounge Bar was Dolly Johnson who, along with her daughter Marjory, who was the head waitress in the Dining Room, provided many years of dedicated service to the hotel. The room attached to the public bar at the rear of the hotel was a popular venue for playing darts. Over the years many distinguished people, to many to mention individually, have been guests at the hotel, including Sir John Betjeman who was Poet Laureate at the time. He afterwrds wrote a poen entitle Shetland. Other famous guests were Beatle Paul McCartney and his then wife Linda. Although the gas explosion of 1926 caused some damage to the hotel in was insignificant when compared with the aftermath of the devastating fire that swept through the building during the night of 14th September 1987. The fire started just before midnight and firefighters fought for over three hours to bring the blaze under control. They were praised as life-saving heroes after two elderly guests had no hesitation in saying that they owed them their lives. One of these guests was taken to hospital suffering from smoke inhalation and several firefighters too were treated for cuts and smoke injuries. All residents, patrons and staff were safely evacuated but the top three storeys of the hotel were gutted and the Lounge Bar of the ground floor suffered water damage. To see the roofles Queens was heartbreaking for many but, like the Phoenix, it rose from the ashes and reopened following extensive refurbishment. Following the death of Alexander I Tulloch in 1986, the family firm, Tulloch of Shetland, carried on the business with Niel Wilkins as Managing Director. In 1993 the Queens Hotel was sold to JWG plc and became part of the KGQ group incorporating the Kveldsro, Grand and Queens hotels. The Kveldsro was sold in 2004 to the Brudolff Hotels Group. The Queens Hotel will be celebrating it's 150th anniversary in 2018 and it is hoped that this historic building will continue to provide a service for visitors and locals for many years to come.